More than just the state of mouth-watering cheese and actual seasons (yes, we're jealous, okay? 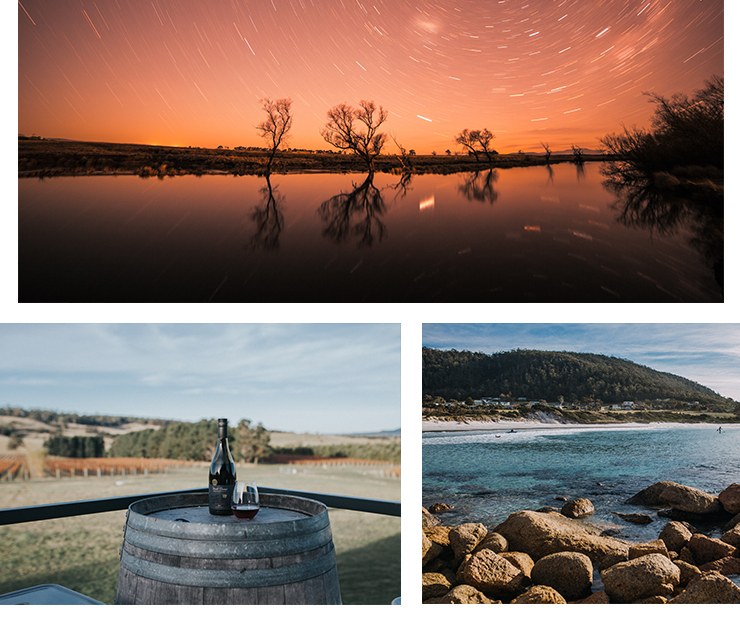 ), Tasmania is also home to more than a few incredible things to see, taste and do. That’s why we’ve taken it upon ourselves to round-up 11 incredible things you can only do in Tasmania. Think a Dutch-inspired tulip farm, ancient trees older than Australia as we know it and enough spots to reconnect with nature to leave your heart skipping a beat. We told you, Tasmania has been holding out on us. Already heading to the airport? Here are 11 incredible things you can only do in Tasmania. We’re just going to come out and say it: Salamanca Market might just be one of the best artisan markets in all of Australia. Controversial opinion, we know. Located along Hobart’s picture-perfect waterfront, the Salamanca Market, held every Saturday, brings together the finest local talent. With over nearly 300 stallholders, expect to find everything from hand-carved woodwork to fashion to glassware and ceramics. And that’s all before we get to the food – think the finest flavours, sourced from the local region, set against a Georgian-era architectural backdrop. Did someone say picnicking with a fresh loaf of sourdough and a slab of mouth-watering Tasmanian cheese while being serenaded by a local musician? We’ll meet you at the airport! …The Aurora Australis. Yep, the Southern Hemisphere also has its very own aurora and it is viewable from some parts of New Zealand, Antarctica and, drumroll please, Tasmania. Take that, Finland. Though scientific predictions are unreliable, the lights shine the brightest during the equinox in September, which also happens to be when Junction Arts Festival is on. Or, you could head to Tasmania in winter, since the short days and long nights mean a greater chance of catching a glimpse of one of nature’s most stunning wonders. The best spots for aurora viewing in Tasmania are Dodges Ferry, South Arm Peninsula and Cockle Creek, as there is little light pollution to get in the way. Just don’t forget to tag us in your Instagram pics. Sure, the Dutch might have pioneered the appeal of tulip fields but that doesn’t mean that Tasmania can’t hop on the bandwagon. That’s where Table Cape Tulip Farm comes in, exploding with vibrant colours every late-September to mid-October. Located at Table Cape, an extinct volcanic vent dropping 180m down into the Bass Strait, the farm features hectares of rainbow tulip fields that just so happen to be the largest fields in the Southern Hemisphere that you can walk through. The farm is even the centrepiece of the Bloomin’ Tulip Festival, in which the nearby town of Wynyard comes alive with food, music, artists and activities every October as a celebration of the arrival of spring. Tasmania, you spoil us. No trip to Tasmania would be complete without a thorough exploration of the mind-blowing Cradle Mountain-Lake St Clair National Park, home to everything from ancient rainforests to alpine mountain ranges. If you’re feeling particularly fit after all those gym seshs consider tackling the Overland Track, a 65-km trek through the heart of the national park. Or, start your journey with a viewing of Cradle Mountain from the picturesque Dove Lake before tackling the Cradle Mountain summit hike. However you like your nature, there’s definitely going to be something for you to feast your eyes on at Cradle Mountain. Okay, we might be a little jealous right now. Any Tasmanian worth the name will talk your ear off about MONA if you let them. In this case, it might just be worth listening. MONA is the biggest privately owned museum in Australia and champions the idea of wacky interactive art. Located in a suburb of Hobart, the art displays at MONA are interactive, entrancing and totally different from your average art gallery. The gallery breathes all things controversial and confronting, the reason they created the Dark MOFO Festival, and you can bet that MONA’s displays won’t lack in this area. Well, what are you waiting for? Designed around the concept of allowing human visitors to experience personal, memorable encounters with wildlife and nature, Tasmanian Devil Unzoo takes the traditional zoo experience and flips it on its head. Cages are removed or hidden and we humans are encouraged to rethink how we approach our place in nature by stepping into the animals’ habitats. This “zoo” is a four-in-one experience that combines up-close animal encounters with a Tasmanian native garden, an original art gallery and countless wildlife adventures. Tasmanian Devil Unzoo is the first park of its kind internationally and a lot of the work it does goes towards saving the endangered Tasmanian Devil. Romping through a natural wonderland for a good cause? Don’t mind if we do. The Port Arthur Historic Site, located about 90 minutes away from Hobart, is the best place in Tasmania to learn about Australia’s origin as merry old England’s prison island. In 1833, Port Arthur became a punishment station for repeat offenders – or basically the worst offenders in the country. Now, you can wander around the lush grounds, have a leisurely look at the British Empire’s first juvenile prison or the horror-inducing silent prison, or take part in a chilling ghost tour as the sun sets. Yup, you could be hunting for things that go bump in the night, by lantern light, in a 184-year-old prison system and asylum. If you need us we’ll be donning our best khaki jumpsuits and ghost-sucking vacuum cleaners and heading to Port Arthur. It’s a tough job, but someone has to do it. If there’s one thing you can say about us, it’s that we love a good ancient tree (and a killer burger, of course). The aptly-named Arve Big Tree, located only ten kilometres from nearby Geeveston along a sealed road, is a whopping 87 metre tall eucalyptus tree that looks like it walked straight off the set of Avatar and set up camp in Tasmania. The tree itself is gorgeous, with a surface that blends cream and light green smooth bark, and has survived both logging and the 1967 fires that swept through the area and destroyed many similar aged trees. Guys, this tree is most likely older than European settlement in Australia – consider us shook. Book a flight, go to Tasmania, see this amazing tree, tag us in your ‘gram photos, and then watch the jealous likes come rolling in. One of the most famous locations in the world, Wineglass Bay is top of Tassie visitors bucket list for a reason. Voted one of the top ten beaches in the world (!) Wineglass Bay boasts an insanely-green sheltered cove and water so blue it looks almost fake. Located in the stunning Freycinet National Park – the summer playground of many a Tasmanian local – Wineglass Bay is only accessible by a steep hike or by kayak, both of which offer views we wouldn’t turn our noses up at. That means that the beach is far less crowded than more popular beaches, despite its world-famous reputation. Inside tip: book into a luxe accommodation option at the seaside village of Coles Bay before tackling the hike to Wineglass Bay. Just trust us on this one. Stretching 50 kilometres along the east coast of Tasmania, the Bay of Fires is often regarded as one of the most beautiful places in Australia and we couldn’t agree more. Start your journey at Binalong Bay, located at the southern end of the bay, and then take your pick of the myriad activities to choose from. 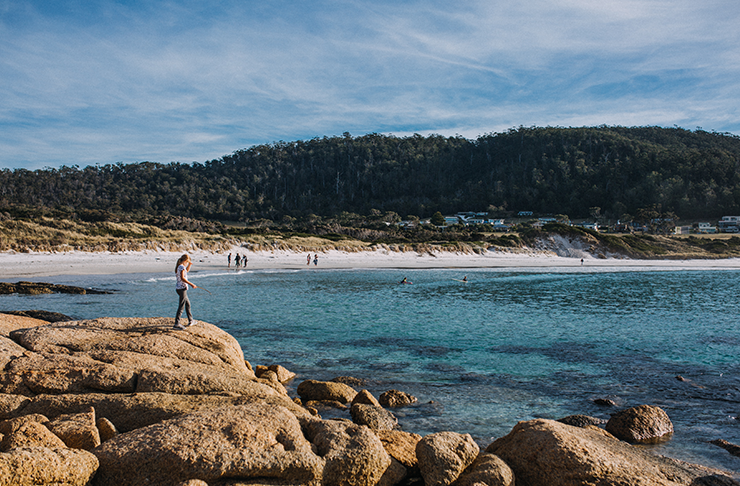 The Bay of Fires offers everything from hiking to game fishing to swimming in the clearest ocean we ever did see. Named for its stunning rusty-red rock landscapes and white sand beaches, the Bay of Fires is an un-negotiable must-see on your Tasmanian adventure. Don’t worry, you can thank us later. Experiencing itchy feet? Make sure to check out our brand new travel page for all your wanderlust inspo needs.